I'm in a Hallmark store near you!!! 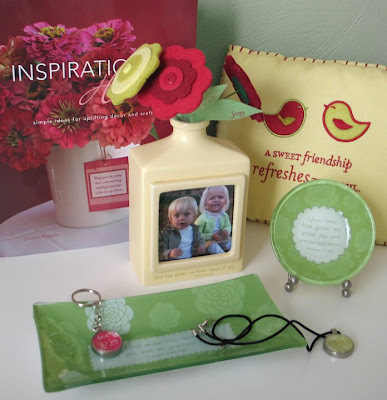 Well, my new gift collection, that is: Simply Inspiring by Jeanne Winters. Seriously, my goal is to hear tales of store managers being trampled by eager customers seeking out that Simply Inspiring stuff. Is that a lot to ask? And, one more little request ... Would you pleeeeeease be so kind as to tell everyone you know and anyone you've ever met? Like send this link to your mom, your Aunt Crazie, your ladies' Bible study, your OBGYN, your bowling teammates, your spouse's company directory and your third grade math class? Hey, thanks! You're a peach! 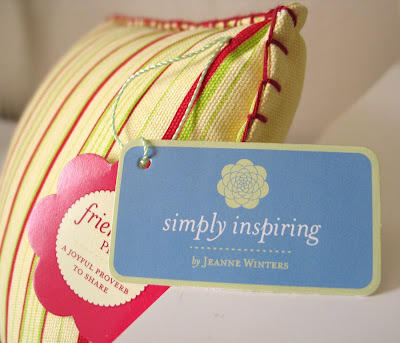 THE GIVEAWAY: TWO WINNERS will each receive THREE new products from Simply Inspiring by Jeanne Winters. I'll contact you for color preferences then pick three gifts for you! 1. Simply comment below with your pinky swear you will race down to your Hallmark store today! 2. For TWO extra entries, blog about this post and link to it. You can then come back and leave another comment telling me you did so. If you don't have a blog, you can email a plug for me to your entire address book, or at least a bunch of people, and cc me on it (see upper right for my email). Do BOTH for FOUR entries! 3. Grab either of my new buttons over on the right and post it on your blog for another entry. Post both for TWO extra entries! Contest is open until midnight MT, Nov. 30th. Winners must have a US address I can ship to. Leave your email or a way to contact you if you win! I too found your blog through Just a Girl. Congratulations on all your hard work paying off. I'm sure it will be a huge success, the items you've shown are beautiful. I can't wait to see them in person at our local hallmark store! Beautiful. I want it all! wowe! how exciting!! i'm thrilled for you! Yay, Jeanne!! This is such amazing news!! I am so at my Hallmark store tomorrow! Actually I can think of 5 different Hallmark stores within close proximity. I'll go to all of them and make sure you're there! :) You bet I'm grabbing a button and will be blogging about your fabulous news and giveaway!! Congratulations, that is so exciting! I will definitely be checking out our nearest Hallmark store as soon as possible to check it out! Those are SO cute! Congratulations! I went to my Hallmark store today, but they don't have it just yet. Hopefully in time for Christmas!! Congratulations on your Simply Inspiring line! I love it's clean classic and fresh color scheme. Hmmm...I think I saw this color scheme in your studio/office space several posts back. I love this color combination also because it is ight and airy. I will go to my Hallmark store and look for your display. Looks like great itms to give for gifts too. I will add your buttons to my blog. I also put both buttons on my blog...they're so cute!! I am so excited for you!! I also "stumbled" your post in hopes of you gaining more traffic. Good luck. I am totally going to check out your stuff at Hallmark. I posted about it and added your button to my sidebar. Lovely - I want it all! These gifts are pure delights to the Lord. I am actually going there tomorrow and will see if they are there. I would love to be able to win this one, what a treat! Wow!!!! Congratulations on this very cool product launch! I love your ideas! I am posting about your giveaway on my blog...and adding the buttons! Thanks for doing this!!! I will definitely see if I can find a Hallmark store nearby! I don't even know where my local Hallmark "provider" is! LOL I haven't bought a card at one since I moved here 8 years ago! LOL But, I promise I'll look it up and track it down now that I know I have something to look for! I'm so excited for you Jeanne and excited for Hallmark to be carrying something so inspired and inspiring!! Oh this collection is gorgeous! And I love Hallmark! Will be looking for your Collection! Everything is so pretty. And it is fun to have some new Inspirational like this. hi, popped in today, i follow your blog and i am so excited for ya, the line is soooo pretty. I just found your blog through Laurel Wreaths Reflections and love your products. I will check them out at Hallmark! And tell my friends by displaying your link on the sidebar of my blog Heart Choices. I'm glad to have found you. And congratulations! I LOVE your new line! I'm going to check it out for some birthday gifts! Also, I posted about it on my blog, put your buttons up with links to your blog and Etsy shop! I was just visiting from "Just A Girl", and your stuff for Hallmark is way cute. I will be looking for it! I live in a very small town, so I'll have to wait till I get to a bigger city where they have a Hallmark store, but seriously it looks very awesome! I came here through Just a Girl . . . love your beautiful work, and you must be so excited to see it displayed in stores across the country! Now I have an excuse to visit my favorite Hallmark store more often! Hope I win your stuff before I can buy it! I found your blog through CWO. What beautiful inspirations! I'll visit the Hallmark 2 miles down the road! I'm posting a button tonight. Can't wait to check my Hallmark store. I'll be blogging about your work and posting the buttons! Can't wait! Crown hallmark? Will that include Walgreens? We have hallmark stores in our area, but I don't know where is the closest Crown Hallmark is? But I will try to find one! Hi I just found out about you through Laurel Wreath....I love all those kinds of things...I can't wait to get to a Hallmark to look at all of your beautiful things! Please enter me in your giveaway! Can't WAIT TO FIND THESE THINGS! I LOVE those magnets! and getting ready to send out the email! hi! 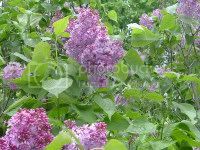 I found your blog through Purple Diva. wowzers!!! amazing stuff!!! Fingers crossed! I just read your news on Christian Women Online's site and HAD to come over and say congratulations! How awesome. And yes, I'll definitely be posting your buttons too. i will happily pitch a fit at my local hallmark store for you. you are so talented and funny! warmest congrats to you on the new line. how exciting!!! I am so delighted to find you> What beautiful things! I can't promise to get to Hallmark today but will one day this week. I found you though a post on Laurel Wreath's blog, so the system does work! This is an additional comment to let you know I blogged about your giveaway and posted your button. Hi Jeanne, Thanks so much for the opportunity to win a gift. Your merchandise is beautiful. 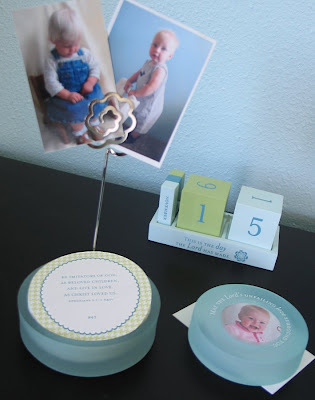 I had recently seen something that I loved at a Hallmark store and didn't really look too hard because finances are tight... but I was admiring... well as I see your blog is was one of your designs. Pretty awesome. I will definately tell people and blog about it... You can check it out! God Bless, and may the Lord grow your product line. Beautiful. I wonder if I can get it in Canada? Hello! I found your blog through barbara h. at Stray Thoughts. These products look beautiful! Congratulations on your new Hallmark Line! I will look at Hallmark the next time I am there. Oh my gosh... this is so so so exciting! I'll head over there after work tonight. Cute buttons. You can view it on my blog www.ourdelightfullife.blogspot.com. I love, love, love all your new products! Can't wait to see them in the store. Wow! Congrats on your accomplishment! That stuff is so cute! I will definitely go to Hallmark when I am at the mall!! I would love to win and plan to head to the Hallmark two blocks from home in the morning. Oh my goodness! I am gone for 9 days, and I miss 3 incredible blog ideas and a giveaway! Your stuff is amazing!! You can be sure I will also blog about it, and I have already told all my friends about you, but I will again. Hallmark...tomorrow...I am there! And, I will figure out how to add your button, too. Congratulations!! Wow! This is amazing, a dream come true maybe? Thanks for checking out my blog, looks like I got here just in time for a fabulous giveaway! Good luck to everyone! What a lovely line; I really like the color palette you chose! Way to go, I'll be keeping my peepers peeled for your products. Lovely, lovely creations! I'll be looking for your products in my local Hallmark shop! I found your blog through Heidi Ann. I love what I see here. The decoupage balls are a wonderful idea. I have both of your buttons on my side bar. 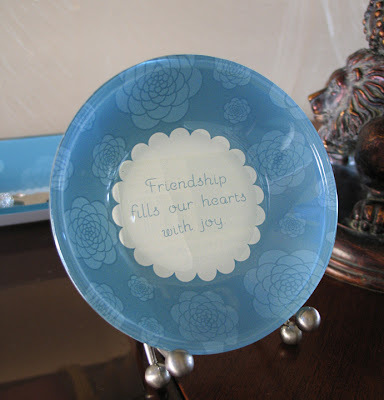 Plus I blogged about your give away and you new things at the Hallmark shop. Plus I included your button on my blog too. So how many entries does that qualify me for now? I lost track. LOL! Love your stuff!!! Oh I forgot to tell you I won't make it to the Hallmark shop today. None in my town. But I can go after work tomorrow. There is one near there. Plus today I am nursing a really bad headache. Not going to try to go anywhere today. But I promise I will check to see your things are in the shops I go to. Oh, I will definitely pop into my Hallmark store next time I'm browsing at the mall! Your designs are so lovely and sweet! Our local Hallmark store it closing!! I'm very bummed not to see your stuff on the shelves. You do beautiful work, I love all of it. Beautiful products and a great giveaway! Thanks for the chance to win! How is it that I'm just now seeing this?? Congratulations MS. HALLMARK!! I'm grabbing your button and telling anyone who comes by my place about your great collection. I LOVE LOVE LOVE faith gifts! BTW Did I say CONGRATULATIONS??!! Just so excited for you! Congratulations! I have many friends who work for Dayspring and I am very familiar with their products. I'll check my Gold Crown store when I am out shopping this weekend. I love your stuff, and I added both of your buttons to my blog. Blessings! Love it! I can't wait to see if my Hallmark store has it. As a Hallmark Gold Crown customer, I get many of my gifts from there. Your creations are BEAUTIFUL...can't wait to buy some things for gifts (and myself)! Just blogged about you as well! Happy sales! Congratulations! 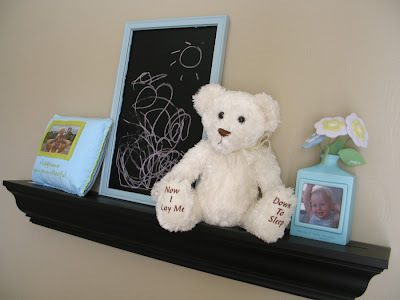 Your creations are beautiful and cute and what a great place to have your products. I am fixing to put your button in my sidebar. Oh my! What wonderful gifts! I already bought one of these a few weeks ago at Hallmark for a friend's birthday - loved it! What fun to "meet" the person behind it! I am so excited for you....you would think it was my line! I have been on a crusade to get more Christian stuff out there....I think there is a huge market for it. I would love some Christian wrapping paper..... hint hint! Preacher's wife linked me. Praise God for the blessing! Great stuff! Wow, congratulations on your success! I will definitely be going to Hallmark to check them out! Your designs are beautiful! My Hallmark is just around the corner and up the street. I plan to go there specifically to look for your creations. Congratulations. Congratulations! I am excited to find them in the store and actually put my hands on them. Please count me in! I'll do a post too, but I didn't want to distract from my Gratituesday post today, so I'll get one up later linking over here. I was in Hallmark yesterday and commented to a friend how much I loved your stuff. Funny how at the time I didn't know it was you or your stuff! It is all so wonderful. I LOVE Hallmark, it really is one of my favorite stores!! :0) I remember as a teen, just popping in to look around and take in the pretty sights and smells. These are so sweet! I love the colors. If I throw a fit at the store, do you have any rugs that you have made, so that at least I can have something pretty to look at while I'm down there on the floor? BTW, food would be good too because screaming hysterically and kickin' my feet works up an appetite. I'm heading to the Hallmark store on Friday -- yep, Black Friday and I will be there begging for Simply Inspired items. Love the girlfriends items, they're the perfect compliment to my book, Girlfriends, God and Grace. I can't wait to see them live and in person. I wrote a blog post and linked to your post and added your button. I found your blog through The Preaches Wife. Congrats! Your work is beautiful! Love these Products! I was sent to you by Lisa (The Preachers Wife) and would love to be entered in the giveaway! I will be going to Hallmark this weekend! Also I will post this on myspace blog! Thanks for your creativity and your willingness to make others happy too! God Bless You! Cute Stuff!! I found you via Lisa @ The Preachers Wife! I can't wait to check out the Hallmark Store soon! Yes, Canadian Hallmarks can carry the gifts, too. I love your stuff. Congrats. i hope they carry it in Canada too! I thought I commented earlier! I came over from lisapw and God is Able (Patty) AND MarySnyder.com!!! Your designs are gorgeous! I realize I don't know you, but HOW EXCITING!!!!! I'm excited for you and I look forward to doing some shopping. Going to Hallmark tomorrow. Congrats. Oh, that is lovely. Congratulations!! I definately will check them out on Friday - assuming they are in our Hallmark store already. This is great. Congrats. It is so nice to see inspirational stuff in a main stream store. I will check it out. I posted your button on my side bar. I came over via Preacher's wife. I pinky swear that I will hunt you down in Hallmark! hi! i was at my local hallmark store last night and saw your stuff. it is all beautiful! how exciting. the colors, fabrics, design, logo -- all lovely!!! warmest congrats to you! living the dream! Truly amazing gift items. Thanks for the chance to win. All this stuff is beautiful. I also...want it all. I will tell everyone i know about it and go to my local Hallmark and take a look!!! Great gift ideas!! Thanks for your wonderful things! Absolutely beautiful stuff. 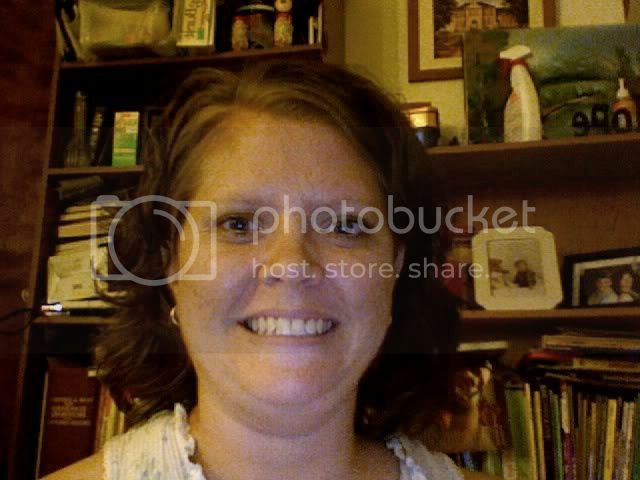 I got your blog from Mary R Snyder's Joy Filled Living Blog. Wow, your stuff is WAY too cute! I'm definitely going to go check out our Hallmark in the mall! Love your stuff, I just found you through Tip Junkie. Congratulations on Halmark, that is wonderful for all of us to see how far our home crafting can take us! I put both buttons on my blog and I am crossing my fingers! These are beautiful creations. I would love to give one of these to each of my 3 daughters. I will plan to go to my local Hallmark this weekend. Thanks! I can't "pinkie promise" today, but I can promise that I will be looking for your awesome stuff...And will be buying some as well! Congrats on making the "big time"! Hi! I found you on Tip Junkie! I bet you feel on top of the world right now, Congratulations! Your items are beautiful. I have to drive about 45 miles to a Hallmark, but I will make a point to look for your line next time I am in the vicinity of one! Here is my pinky swaer! I LOVE your things - and the colors are to die for! I came, I saw, I BLOGGED! I'd love to be entered in the giveaway. Thanks! Congratulations! The items are beautiful, I would love to be included in the giveaway! What unique and beautiful art! Count me in on this giveaway! I love Hallmark -- and I especially love your designs and the fact that the greatest message on earth will be displayed for so many to see, purchase and enjoy. I will definitely be blogging about this on Black Friday. What a wonderful giveaway! Congrats on your new line! These are such great products. Will definitely check them out at Hallmark! Gosh you stuff is just gorgeous! I will be looking for it in the hallmark store soon! 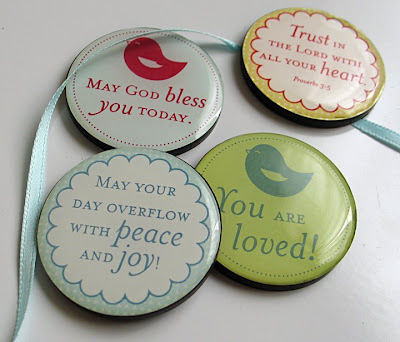 I blogged and posted your button on my blog. I can't wait to see this stuff! I added your second button too! Awesome! Congrats! I can't wait to see your stuff at Hallmark! I just found your blog from jumpin-ins blog. I will definietly go to Hallmark soon. I shop at Hallmark all the time. Wow I'm corresponding with a celebrity! Going straight back to my humble little blog and posting about your site, and adding a button! Glad to be of help in spreading the word - and love having a chance in the giveaway! found your blog thru the Preacher's Wife (Lisa)....love your products! I went to Hallmark in Austin, Texas and saw your things! Some of the hallmark's are independently owned so I'm sure it's hard to find. Your things are amazing! I was at my favorite Hallmark store today and didn't even see anything like this. What a great new product idea. I love your blog! I always check it out. I saw it in CWO. I admire your unique creations! I am sorry to say that we don't have a Hallmark store here. Just Hallmark cards I guess. I'll just put one of your buttons in my page. Please email me if I win at moffatt03(at)yahoo(dot)com and I'll give you a US address where you could ship the gifts. Thank you so much! GOD BLESS YOU ABUNDANTLY! P.U.S.H. I am new to your blog...found you while clicking through tipnut looking for Christmas crafty stuff. Enter me please. Here's wishing you great success with this enterprise! New to your blog. Great stuff, I will be sure to spread the word. Your stuff is so dang cutE!! What an awesome thing this is like a dream job! I will definately be heading to Hallmark very soon! I am also going to post about this on my blog. Hallmark is lucky to have you on their team! Congrats! I've enjoyed your blog, and just found your link to here. I'm so glad I clicked onto hear. I will be looking for your line from now on. I just love your site. Nice to visit your blog. 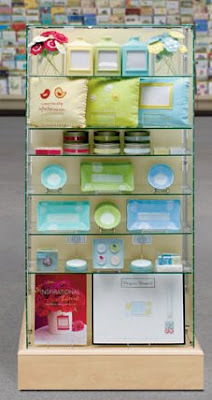 I pinky swear I will GO BACK to my Hallmark store to see your product line! Everything is beautiful! I will definitely visit my Hallmark store. I'm in the mall almost every day. BTW, I've got both your buttons on my blog. What a beautiful gift you have received. You show that faith in all you do has its rewards. Your story is truly Inspiring. I have posted your Bloggy button on my Bloggedy Blog Blog. So glad to find your blog! I love Hallmark products and I'll be on the lookout for your this Christmas season..all your objects are so lovely! There are a couple of big Hallmarks in Lower Manhattan that i love to shop in.